When you’re at a public place, you might want to use free public WiFi. Companies provide free WiFi access to the public to increase their user base. A great example of this is Google. The search engine giant has installed routers at 1000s of railway stations. If several companies are offering free WiFi service at a park, railway/bus station, library, college, etc, it can be confusing to decide which network you should use. This is because the connection speed and quality may vary. 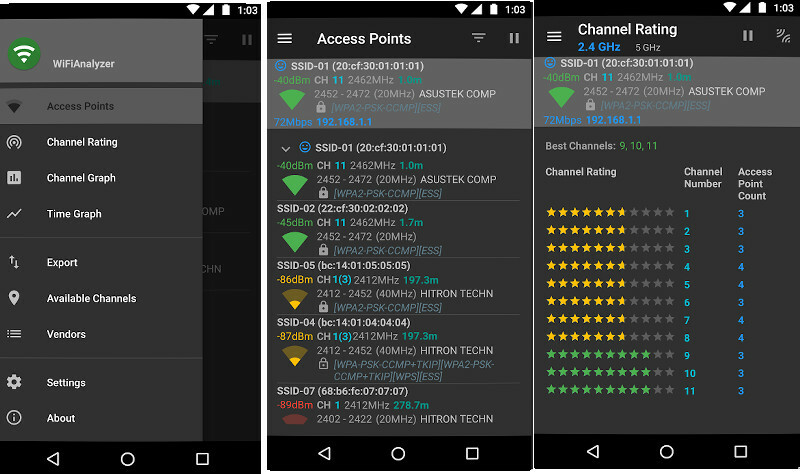 WA is a tiny application that converts your phone into a powerful WiFi Analyzer. When you run it, WA will find available WiFi network connections at your place. Then, WA will update the signal strength graph displayed on its main interface. The app can generate 3/4 types of graphs. It updates the graph in real-time. The app makes you aware of the manufacturer of the router/hotspot. It displays the security protocol the wireless device is currently using. If your phone is connected to the network, you can see the MAC address of the device and the IP address assigned to your PC with this application. 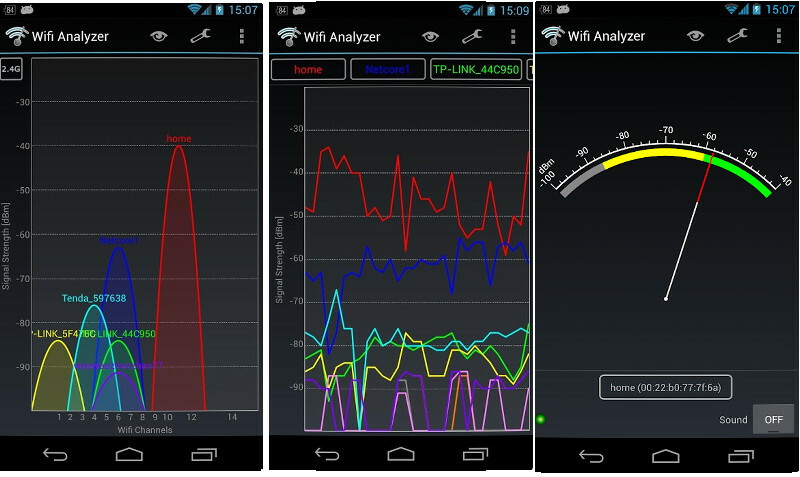 WiFi analyzer allows you to take a snapshot of the graphs, statistics, etc. It features a signal meter tool through which you can see the WiFi device’s signal strength. Prevent screen from turning off. The size of the WiFi Analyzer application is around 5 megabytes. WA displays horizontal banner ads. It employs dark theme. Netgear WA allows you to see the signal strength and the operating frequency of a network connection. This app can generate a network signal strength graph. It lets users keep a record of signal strength in various rooms of the apartment. By default, the statistics displayed by this application are refreshed after 1 second. You are allowed to change the refresh interval in this application. Although Netgear WFA has good features, it has a few drawbacks. For some reasons, the app requests location access permission when you run it for the first time. It doesn’t make you aware of insecure network connections. 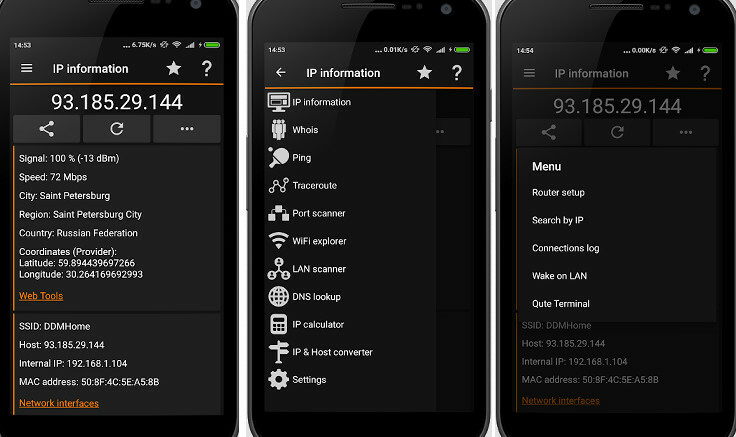 WiFiAnalyzer is an open-source app which doesn’t require any special permission to work. It also lacks advertisements. Instead of displaying the connection signal, device manufacturer, security protocol, etc in a separate interface, WA shows the complete details of the connection on its main interface. WFA provides filters to shortlist connections by their SSID, WiFI band, security, and signal strength. It includes an export option through which you can share the connection details with other users. It supports dark and light color themes. Unlike other apps that don’t allow you to pause the WiFi scanner, you can pause/resume scanning in WFA. The app lets users see the WiFi bands/frequencies supported in various countries. Like other WiFi analyzer applications we’ve covered here, WFA generates graphs that displays the signal strength of the WiFi networks the phone can detect. You can customize the graph by changing the maximum support signal strength value or by hiding the graph/time legend. What features does IPT’s WiFi Analyzer provide? A real-time graph of network signal. SSID, signal level/strength, supported protocols, BSSID, bandwidth frequency and the channel of all WiFi networks the phone can detect. 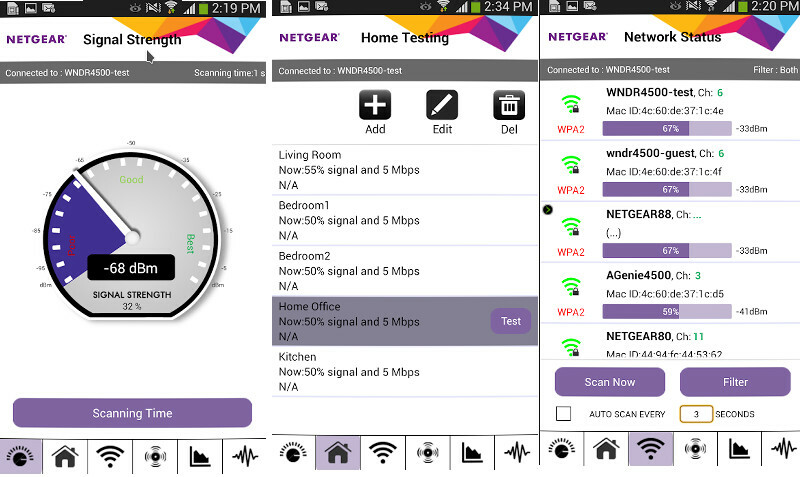 NM is one of the most downloaded WiFi Analyzer apps on our list. 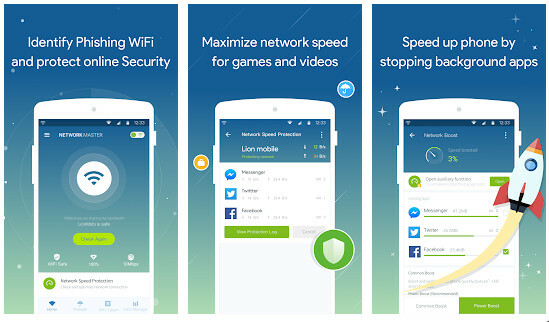 It is the only app on our list that displays the real-time network connection speed on the phone’s status bar. NM detects the number of devices that are connected to the network. It has a network speed optimizer tool. It also features a WiFI Spy detect tool which displays the IP addresses and name of the devices that you’ve authorized/you haven’t authorized to connect the router/hotspot. NM’s WiFi analyzer tests the security and speed of the network device your phone is connected to and optimizes it if required.